Jeremy Corbyn, centre, accepts congratulations after he was announced as the Labour Party's new leader as fellow candidates Andy Burnham, Yvette Cooper and Liz Kendall look on. Burnley’s Labour MP Julie Cooper has called on her party colleagues to back new leader Jeremy Corbyn. Mrs Cooper was speaking after left winger Mr Corbyn was elected the new leader of her party with a resounding mandate – 59.5% of first preference votes. 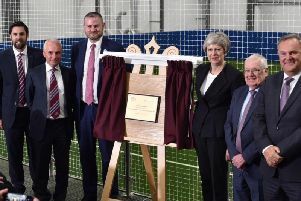 Burnley’s new Labour MP, elected in May, had given her backing to runner-up Andy Burnham, but said all party members should now back the new man. She said: “This is a very decisive result. There is no arguing about it. It’s plain to see what the party members want. “The job now is to get 100% behind the leader and the deputy. The leadership race has been a bit of a distraction over the last few months. Mrs Cooper also tweeted her congratulations to the new deputy leader Tom Watson. Corbyn, a 500-1 outsider at the beginning of the leadership election, won the race to be leader comfortably with 59.5% of votes beating rivals Andy Burnham, who trailed on 19%, and Yvette Cooper who received 17%. The “Blairite” candidate Liz Kendall came last on 4.5%. The election of the North London MP as leader marks a sea change in the party’s shift back to its traditional left wing from the New Labour days of Tony Blair and Gordon Brown. Burnley Borough Council’s Labour leader Mark Townsend admitted he had voted for Liz Kendall, but echoed calls to get behind the new leader. He said: “I felt Liz Kendall would appeal to the wider electorate rather than just the inner members of the Labour party, but we must get behind Mr Corbyn. “It will be a difficult situation, but I don’t believe this appointment will split us, although it is relatively new ground for us all. “We face challenging times over the next few years and are now in a totally new environment. It will be interesting to see how Mr Corbyn approaches the challenge of getting Labour back in power. Corbyn has promised to re-engage young people in politics.